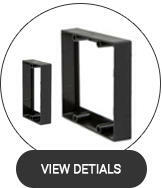 ReceptXtenders electrical receptacle box extenders are specially designed to work with both PVC and metal receptacle boxes. 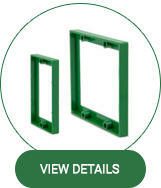 The patented rear flange allows ReceptXtenders to fit snugly against the every style box to assure no gaps are present between the existing box and your newly installed extender. This feature assures ReceptXtenders meet all electrical codes. Since no gaps are present when properly installed, ReceptXtenders have gained the listing of Underwriters Laboratory (U.L.) ReceptXtenders are U.L. 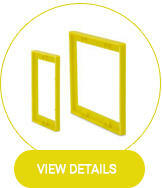 Listed and made from non-flammable, self-extinguishing materials. 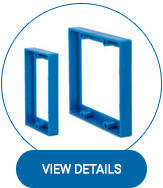 ReceptXtenders are one of the only extension rings or extenders to work with every style box made. Don't get surprised when you expose the box in the wall, with ReceptXtenders, the extender will fit! ReceptXtenders allow you to shim out that electrical box flush with the newly installed wall covering without removing or repositioning the existing box. This saves time and money. Gadget Mania Inc was formed, to market and distribute our ReceptXtenders product line. ReceptXtenders were developed to fill a need every electrician and home remodeler faced. When covering the existing wall with a new wall surface such as drywall, ceramic tile, paneling or even barn-board siding, the existing wall outlet is now buried too deep into the wall. Receptxtenders were born! For years, the only available extension device was a stamped metal device. It was NOT U.L. listed because of its construction. Open edges still allowed a path for a potential fire. The fact it was metal, it easily shorted against the device terminals. This required the user to tape up those exposed terminals to try to prevent the shorting. Why Pull Out The Box?